In 1874, General George Armstrong Custer’s army expedition discovered gold in the Black Hills of South Dakota, which reignited gold fever in the American West. Getting supplies to the remote region where gold deposits had been discovered concerned many of the prospectors. The most direct route to the mines was overland along the Sidney-Deadwood Trail, a 267-mile route that stretched from the Union Pacific Railway at Sidney, Nebraska to Deadwood, South Dakota. That route, however, required the construction of a bridge to allow freight wagons and stagecoaches to cross the North Platte River just west of what is now Bridgeport, Nebraska. Contracted by Omaha businessmen in 1875, Henry T. Clarke, a veteran bridge builder, designed a toll bridge to span the river. 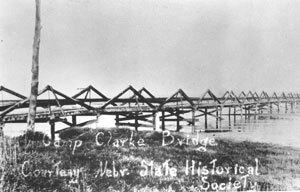 Clarke’s impressive structure measured over 2,000 feet in length and had sixty-one trusses and pilings set deep into the soft bed of the North Platte River to help stabilize it. Use of the bridge was at its highest shortly after its completion during the peak of the Black Hills gold rush between 1876 and 1880. During this boom period, the area around the bridge featured a saloon, blacksmith, hotel, general store, and corral. By 1882 though, gold fever was cooling, and a direct rail line into the Black Hills made the overland route unnecessary. A new bridge built several miles to the east at the nearby town of Bridgeport in 1906 effectively replaced the Camp Clarke Bridge, which was closed. By 1913, many of the buildings around the old bridge site were in disrepair, and subsequently they were razed. No structures remain at the site today. A historical marker located four miles west of Bridgeport, NE along US Hwy 26/92 marks the site of the Camp Clarke Bridge, which is no longer standing. A scale model of the bridge and other information regarding the structure can be found at the North Platte Valley Museum. The museum is open Monday-Friday from 9:00am to 4:00pm and 1:00pm to 4:00pm on Saturday and Sunday. Admission costs $3.00 dollars for adults, $1.00 for children six to 12 years of age; children five and under are free. The museum is located at 900 Overland Trails Rd. at the corner of J St. and 11th St. in Gering, NE. For more information, call 308-436-5411 or visit the North Platte Valley Museum website.